There are currently two Delta wood lathe models available, the 46-455 and 46-460. The company has phased out their full-sized lathes over the last few years, and now only produces midi lathes. A midi lathe has several advantages over a full sized lathe. It offers most of the capabilities of a full-sized machine (when an extension bed is added), and takes up less floor space. It is portable (without the extension), and costs less than a full size woodworking lathe. The midi lathe models that are on the market today offer many of the features that used to only be available on full-sized models. They are a great way to get into turning without breaking the bank or getting a machine that will be outgrown in a few months. optional extensions that expand the between-center distance out to 42", 67-1/2", or even 93"
The Delta 46-455 has a 3/4 HP motor with 5 speed pulleys that provide a range from 500 to 4000 RPM, and uses a 4-rib belt. The Delta 46-460 uses a more powerful 1.0 HP motor that has a variable speed control. It has 3 speed pulleys and uses a 6-rib belt. The lowest range will go all the way down to 250 RPM, and it has the same top speed of 4000 RPM on the highest speed pulley. The motor on the Delta 46-460 is also reversible, which helps you get a much smoother finish when finish sanding. A reversible motor is very rare in the midi lathe category, and helps the 46-460 Delta wood lathe stand out among its competition. Although the Delta 46-460 costs roughly $100-$150 more than the 46-455, the 46-460 is much more popular. Fine Woodworking Magazine reports that a Delta product manager said 80% of Delta midi lathe purchasers opt for the 46-460 model. I only found three reviews of the Delta 46-455. The variable speed control, lower "low" speed, and reversible motor feature are worth the extra money for most woodworking lathe buyers. NOTE: The 46-455 has been discontinued, but is still available at the moment from Amazon . Most of the reviews are very positive, and many of the poor ratings the Delta wood lathe has at Amazon are from folks that received defective or damaged items and were having trouble getting replacement parts. 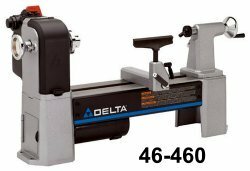 The Delta 46-460 received the "Editor's Choice: Best Overall" award in a comparison test of five heavy-duty benchtop lathes in the 2012 Fine Woodworking Tool Guide. The Delta 46-460 has a lot of fans on the woodturning forums who are thrilled with it and recommend it highly. They say that it is easier to change pulley speeds than on many other woodworking lathes, and one review I found says that he rarely uses the middle pulley - with the belt in the low speed position, the highest speed is 700 RPM, and he goes directly from that one to the lowest speed on the high-speed pulley, which is 1350 RPM. There are a couple of relatively minor concerns, though. Some owners feel that the banjo and tool rest construction is weak, and that the tool rest is made of too-soft material that dings rather easily. Several times though, other owners chimed in and said that these were not really issues with the machine itself but with the users technique, and that the banjo and tool rest on the Delta midi lathes are no softer than others in this class. Overall though, the comments are very positive. The current line of Delta wood lathe models has set a new standard in the midi lathe market, although the Jet mini lathe still deserves consideration. Both Delta wood lathes come with a 5-year warranty. With variable speed, the reversible 1.0 HP motor, and the low 250 RPM setting, the Delta 46-460 midi lathe is tough to beat. If you just want a basic model to learn on, the Delta 46-455 may fit the bill. If you add on one or more of the bed extensions, either Delta wood lathe can handle most of the projects that a full-sized model can, for way less money. For more detailed specs for the Delta wood lathe visit DeltaMachinery.com. Note: If you are new to woodturning or a veteran that is interested in getting more out of your lathe, there are tons of great woodturning books out there. The ones that are recommended most often for beginners on the woodturning forums are Turning Wood with Richard Raffan and The Lathe Book: A Complete Guide to the Machine and Its Accessories by Ernie Conover. I would recommend either of these books as an introduction to woodturning - I have an older edition of "Turning Wood With Richard Raffan" and it has been a great resource for me as a beginning woodturner.